In POWERHOME Solar’s northernmost markets in Michigan, Ohio and Pennsylvania, snow is a fact of life in winter. But Mother Nature’s big white blanket is not the best thing for solar production, as snow cover on your panels can prevent your array from producing energy. What are customers to do in these cases? 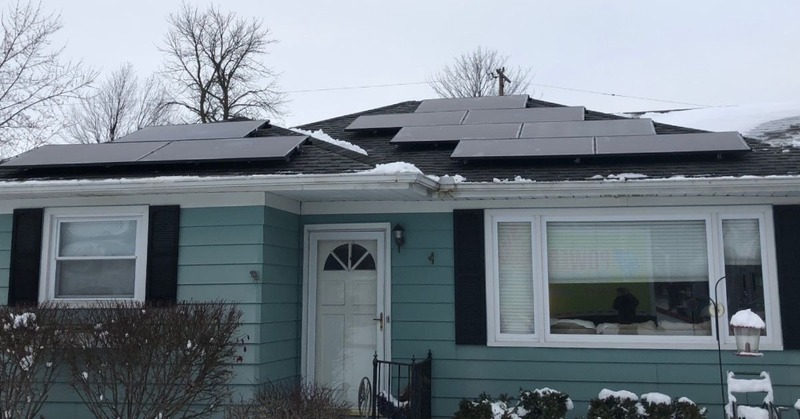 There are a number of things consumers can do to keep their panels clear of snow, but perhaps the safest and most cost effective strategy may be to simply let the snow melt. Solar panels are most commonly installed on the south side of homes because it’s the side that gets the most sun each day and therefore gives customers the greatest potential for production. Most times, the sun will melt the snow from the south side of your home in 2-3 days. Don’t believe us? Why don’t you ask your neighbors whose homes face north how long it takes for snow to melt their driveways? And while snow can temporarily limit your panels’ production, remember that your home is not shut out from power during this time, as the power grid acts as your backup to cover your home’s needs. However, letting the snow melt is not the only option customers have to have snow-free panels. You could purchase a Roof Rake that comes with a rubberized head designed not to damage the surface of your panels. But that also may mean getting on a ladder to get your solar array’s hard-to-reach spots, and there’s some danger in that. Letting the sun melt the snow keeps you from climbing a ladder and risking potential injury. The angle that your roof panels sit on also means the snow can simply slide off as it melts. Or in the case of very dry snow, wind may do its job in helping you. Those who want uninterrupted solar production should check their solar panel warranty before using any instrument to clear off their panels. While wintry conditions can temporarily affect your system’s performance, it’s important to note that the goal of your solar energy system is to offset your energy usage over an entire year, not any given day, week, or month. In the sunnier summer months, your system can generate more energy than you use, generating electric bill credits. In the cloudier, winter months, your system may generate less energy than you use, and you can use the credits you generated during the summer. We expect that over the course of a year, you’ll be happy with the production you see. With our innovative solar program, homeowners can go solar for $0 up-front cost, save money on their electric bills, and generate their own clean energy. The solar panels installed on your home are American made and come with a 30-year warranty, with many panels expected to last well beyond that. Please feel free to fill out the form below or contact POWERHOME Solar at 800-765-2715, and one of our solar representatives will help you determine whether your home qualifies for this program. Don’t be scared off by the snow!